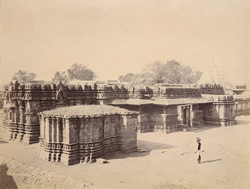 Photograph of the Trikuteshvara Temple, Gadag taken by Henry Cousens in the 1880s. This is a view from an elevated position, looking across the Trikuteshvara temple complex. Within this complex stand the Sarasvati and the Trikuteshvara temples, both of which were constructed in the late Chalukya period and the latter of which is pictured here. The temple in this photograph has two shrines, the principal shrine faces east and is entered through a small closed hall. Inside the shrine stand three lingas as the temple is Shivaite. A second smaller shrine faces the first across a larger open hall. Both temples are decorated with pilasters and panels covered with angled eaves. The brick and mortar spire is a later addition.